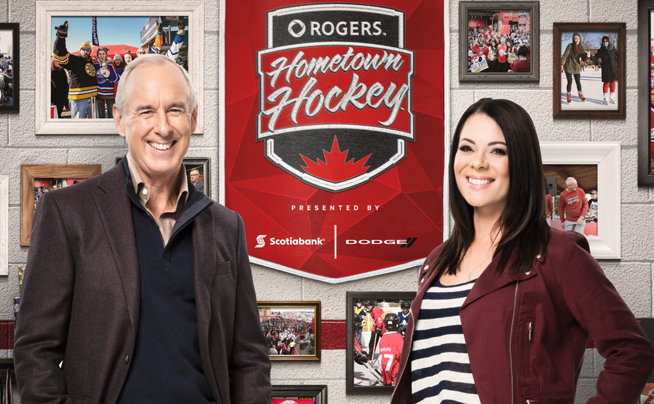 Rogers Hometown Hockey Tour presented by Scotiabank and Dodge is heading to Cornwall for a celebration of hockey on Saturday, March 17th and Sunday, March 18th! The weekend will feature broadcast hosts Ron MacLean and Tara Slone, meet-and-greet opportunities with NHL alumni Shayne Corson and Chris Neil, live local entertainment and engaging activities for the whole family. The two-day hockey festival begins on Saturday, March 17 at 12 pm at the Cornwall Civic Complex and will conclude Sunday evening following the Rogers Hometown Hockey outdoor viewing party. The evening’s broadcast kicks off with a special pre-game show hosted live on site by MacLean and Slone from the Sportsnet Mobile Studio beginning at 7 pm on Sportsnet and Sportsnet NOW, followed by a showdown between the Dallas Stars and the Winnipeg Jets. Helping fans be fans, the Fan Hub features innovative and interactive experiences, showcasing virtual autographs from NHL stars, a hockey-themed Zamboni video game and autograph signings with NHL alumni, such as Shayne Corson and Chris Neil, to unite fans in their passion for the game. In addition, fans are treated to free hot chocolate on site. If you are a Rogers customer you can come to the GamePlus desk in the Rogers Fan Hub and redeem exclusive experiences such as meet-and-greets with NHL alumni, autographed merchandise and tours of our Sportsnet Mobile Studio. Fans have the chance to get close to their favorite players through augmented reality technology. Fans can take photos with virtual images of NHL stars, and have the photo emailed directly to their device for social sharing. Come see Paz, our world-renowned hockey acrobat! Paz juggles everything from pucks to flaming hockey sticks all while standing on top of a net. It is an experience that the family will never forget. A family-friendly space to engage hockey fans, celebrate the game, and interact with NHL alumni, such as Chris Neil. Scotiabank will also be donating $15,000 to minor hockey associations in the community. Features the famous Stow ’n Go Challenge, a hockey-themed obstacle course. Also, fans have the opportunity to enter a contest to win $5,000 for their local minor hockey association and a 2018 Chrysler Pacifica for their family. All contest entrants will receive a co-branded Dodge and Rogers Hometown Hockey retro toque. Features pick-up games for the community, including local Timbits Hockey players. Fans can enjoy a free slice of Giuseppe Pizzeria pizza fresh out of the oven, and play the Find Giuseppe Match Game to win a rooftop experience and other great prizes. Fans have the chance to face off against friends and family with the PLAYMOBIL NHL Arena and its lineup of NHL figures. In the zone, fans will also be able to enter to win a new NHL playset. Features a pit-crew-like experience where fans have the opportunity to test their tire-changing skills on a replica Zamboni. Live music featured throughout the weekend beginning with Amanda Sadler performing on Saturday followed by Sean Harley and Cold Creek Band on Sunday. Alumni from the Cornwall Royals and Cornwall Colts will suit up for a game on Saturday at 11:30 am at the Cornwall Civic Complex to kick off the festivities. Free admission! Past NHL greats will take on a team of local law enforcement all-stars on Friday, March 16th at 2 pm at the Civic Complex! Tickets are now on sale at the Civic Complex Box Office. Cornwall Royals – Take a look back at the 1980 and 1981 Cornwall Royals, who won back-to-back Memorial Cups during these seasons. Such stand-out names as Doug Gilmour, Dale Hawerchuk and Marc Crawford led the team to these consecutive titles. All season long, fans can tune in to the Sunday night broadcast on Sportsnet and Sportsnet NOW for a chance to win weekly prizes through the Rogers Hometown Hockey Contest. Join the conversation by using each week’s unique hashtag to tweet @Rogers to automatically be entered for a chance to win a number of prizes, including a trip to the 2018 Stanley Cup® Playoffs. The contest runs during every Sunday broadcast through to the final Rogers Hometown Hockey of the season on Sunday, April 1 from Montreal. Make a weekend of it and celebrate hockey in Cornwall! Cornwall has a variety of great accommodation options just minutes from the Hometown Hockey festivities. For more information, check out our Accommodations page. While enjoying Hometown Hockey, make sure to explore Cornwall’s rich hockey culture with a visit to the Cornwall Sports Hall of Fame. The Hall features dozens of hockey greats, including Cornwall’s own Newsy Lalonde, one of hockey’s original superstars. It’s one of the many unique attractions you’ll find in Cornwall – check out our Attractions page for more ideas!